National Forest recreational area featuring a small lake with sand beach, swimming, hiking, birding and wildlife viewing, camping, picnicking. 41 tent sites. $15. 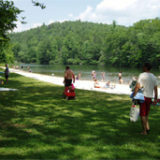 Camping reservations: (877) 444-6777 or www.recreation.gov. Pets Welcome.